The crew at BGR today reported some more information it has received about the first Ice Cream Sandwich flavored Android phone. The device is currently code named "Prime" and BGR's sources say that the phone could be launched as the Google Nexus Prime. With a Super AMOLED HD display with 720p resolution, the odds favor this beast being manufactured by Samsung. A TI OMAP 4460 is expected to be under the hood. With no OEM UI or preloaded software expected on the device, this does appear to be the pure stock Android experience that Nexus models have become famous for having. Unlike previous launches of new Android OS builds which were usually introduced to the public through one device from one manufacturer and one carrier (think Android 2.0 introduced on the Motorola DROID through Verizon), BGR's source says that with Android 4.0, Google could be looking to introduce the new build to the public through multiple OEMs and multiple carriers-each with its own flagship Android 4.0 device, and all launched at the same time. 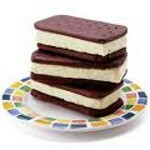 Anyone hungry now for an Ice Cream Sandwich? Lol a Pure Android device on Verizon with no bloatware? You have a better chance of seeing the worst NFL team winning the super bowl. Or mod the phone and remove bloatware yourself. Typical Phadroid response no doubt. Actually, the closest pure-stock android phone on VZW is the Xperia Play. Nice, plain, pure Gingerbread. There is a little bloatware, but almost nothing compared to what is on their other devices. I find it ironic that the device with the most specialized design has the purest of rendering. oh you mean the jaguars? lol. Super-EVO - have you seen the D-Line they have built in Detroit? QB's in their division are hoping the lock out stays on. That is turning into a good team. Makes since, since 2012 is supposed to be the end of the world. Until they stop firing coaches every other year, stop rotating players like a mery-go-round, and quite bragging about how good they were 20 or 30 years ago, the Raiders wear the crown for worse team in the NFL. Gone from being feared to being a punchline of a bad grid-iron joke. Bills Bills Bills have to be the worst! Buffalo, that is. I am from that area and even I agree with you. I hope Verizon's doesn't have bloatware, like Bing. I don't care about VZ nav or Madden but when you make it so pressing the search uses Bing, that's disappointing. I bought android for google verizon. You're only hurting your own sales. a Nexus with Bing? reeeally? would that happen? i still dont understand why they dont just have one phone with everyone's frequencies in it. its not like its that hard to have a world phone. If a carrier doesnt want it, third parties like best buy could sell it for them. VZW has an open initiative that they could take advantage of, and we know Tmobile and Sprint will take it.. which means ATT will take it lest they be left out. so.. super amoled HD is the NEXT iteration of super amoled.. after +? lol. almost makes me want to hold out.. even longer! lol. Hmmm, Carrier's subsidy, ever heard of it? they could still do a carrier subsidy through either the carrier,indirects, or through best buy. Making it a world phone doesnt stop that. The next iphone is supposed to be this way, and its not like VZW and Sprint dont both carry dual cdma/gsm phones as it is. umm.. no not really. the costs would go down as there would only be one factory assembly line instead of 2 or 3 or more for different additions. Radios dont cost that much. Definately less than the cost of machinery, labor, and upkeep. GSM and CDMA are a near 50/50 split in the world, so that old innacurate saying that CDMA isnt a world thing is wrong, its just more easily locked down per carrier. The biggest reason that a carrier doesnt want a true world phone is that it gives people no reason to worry about contracts. If you could buy a subsidised world phone for 200 instead of the 500+ full retail, then pay a $200 ETF and then bounce carriers as often as you wanted, would you? I sure woud.. why not. The carrier loses money and has higher churn.. and you get freedom from their rules.. why would they want that?! Box,Actually, as far as consumer, real world implementation is concerned, CDMA is a newer and more advanced technology than GSM. 1xRTT allowed for more channels per carrier frequency than its GSM cousin did. GSM is still, at its heart, a TDMA based technology. No matter how fast the intervals are, time division multiplexing cannot compete with code division.This is why, after EDGE, GSM went with a cdma based system in UMTS and its subsequent evolutions in HPSA. In fact, disreguarding LTE, CDMA champion QUalcomm had a path for EVDO similar to that of HSPA. With rev B, (some called it Rev N... the N meaning how many carriers you wanted to stack) you coud stack frequency channels much like what is done with WCDMA (the heart of UMTS, etc). Each EVDO channel is 1.25 MHz in size where WCDMA is 5MHz channel. Stacking 4 EVDO channels would give similar performance to 14mbps HSPA. However, further development of both Rev b and Rev C (later known UMB) was dropped when the vast majority of the world's carriers decided on LTE and WiMax as their 4G of choice. This better be coming to AT&T. I hope it comes before school starts. Haha good one. Im waiting for the HTC Holiday on AT&T. But this sounds nice....i just dont want too wait too long. I might just save up and buy this off-contract.